The voices that populate Molly Antopol’s remarkable debut collection, The UnAmericans, are both foreign and familiar. Foreign in the sense that they span across the globe and time, from Communist-era Prague to modern-day Brooklyn; familiar in the sense that they feel lived in, fully embodied, told in the intimate, compassionate manner that the best family tales are. The stories share echoes with many great masters of the form from the past – Paley, Malamud, Bellow – but Molly also forges her own unique path through the tangles of history. As Jesmyn Ward, who selected Molly as one of 2013’s 5 Under 35 National Book Foundation honorees, said, “This book isn’t simply powerful and important—it’s necessary.” We definitely agree. Thanks to Molly for taking the time to answer a few questions about her work and the writing life for One Story. 1. Where were you when you found out your first book was going to be published? How did you celebrate? I was in New York doing book stuff, and that day was hanging out with my good friend Stuart Nadler. His new novel, Wise Men, had come out that day, and we were toasting to that when I got the call about my book. Over the years there had been many other times when Stuart and I had catastrophied about our writing and stressed over when we’d finally finish our books, so it was a wonderful thing to get to celebrate our two books coming into the world at the same time. 2. Your One Story “The Quietest Man” came out in March 2010. What has happened since then? How has your writing changed and what has remained the same? Right now I’m working on essays, and on a novel, The After Party, which is set in the U.S and Israel. When I was working on my collection, I felt like I was pouring everything I had into whatever story I was writing—and so there was something intensely gratifying about starting fresh with a new setting, time period and cast of characters to research and explore, getting to see the world from a completely different vantage each time. I worried about what it would feel like to be in the heads of the same characters for as many years as it takes me to write a novel, but so far—at least in this early stage—it’s been pretty enjoyable to wake up and think about the same people every day. 3. You mentioned back then in your interview with One Story that, “I love the feeling of trying to understand what it would have been like to live in another place or during a different time,” and you do such a lovely, seamless job of inhabiting a great variety of voices in your collection. What story or voice was the most challenging to write? Which did you enjoy the most? Thank you! To be honest, all of the stories were hard. Every one of them took at least a year to write—and the book itself took a decade. It was really important to me to try to write convincingly from the perspectives of women and men, young and old, American, Israeli and European. While I don’t have any stories in the book about women living in San Francisco and teaching creative writing, I do feel that my stories are autobiographical in the sense that they capture what I obsessed over and questioned during the years I was writing them. Interestingly, the hardest story to write was the one most closely related to my own life, “A Difficult Phase.” Like my narrator, I’d also once dated an older man who had a child and a complicated backstory—and it was only years later, when I was back in the town where we used to live, that I started thinking about the dynamics of that triangular relationship, and the complicated repercussions my leaving must have had on his son. I really enjoyed writing “Retrospective.” That was the last story I worked on for the collection, and because it was a longer piece, I gave myself more room to breathe and try some technical things I hadn’t yet attempted in the book. And it was a lot of fun learning more about the underground art movement in Russia and the museum world of Jerusalem—in addition to an insane amount of time in the archives (my favorite nerdy pastime), I got grants to travel to Eastern Europe and Israel for it, and ended up talking a lot with former dissident artists and museum curators. 4. Your book’s title carries echoes of McCarthy’s infamous crusade in the 1950’s and many of the stories take as their subjects characters that are often identified with an outsider status – Communists, dissidents, immigrants. What drew you to these cultures and periods in history? What do you hope modern readers learn from them? Many of these stories were inspired by my family history, notably their involvement in the Communist Party. I come from a big family of storytellers, and I grew up surrounded by tales of surveillance, tapped lines and dinnertime visits from the FBI. I didn’t know my grandfather well—he died when I was six—but a little more than a decade ago my family gained access to his FBI files. The reports followed him across the years and across the country. In the files, I was able to see exactly what the FBI was looking for, but nothing else. They showed nothing of the angst that led him to quit the Party, and how painful it was for him to learn of Khrushchev’s revelations about Stalin—for him to realize that the cause he’d dedicated his life to was corrupt. And they didn’t reveal what being surveilled might actually have felt like for his children—what being watched does to a family psychologically and emotionally. Those were questions I found myself exploring in the book. It’s interesting—though my family loves to tell stories, the one place I never heard about was Antopol, the Belarusian village where my relatives came from, which was virtually destroyed during World War II. A little more that a decade ago I was living in Israel and wound up at a holiday party in Haifa, where I met an elderly woman from Antopol. It was one of the most extraordinary moments of my life. She led me to an oral history of the village, written in Hebrew, Yiddish and English. The moment I finished reading it, I began writing The UnAmericans. 5. When did you know that you had a collection on your hands and what was the revision process like for you? Do you have any advice for writers currently working on a book manuscript? In the beginning, I thought a lot about the difference between writing individual stories and putting together a collection—I was concerned that the stories weren’t related to one another in a neat enough way. In addition to the McCarthy-era stories, others are set in Eastern Europe, where my family’s originally from and where I’ve spend a good deal of time myself; while others take place in Israel, where I live a few months every year and used to live full-time, working at an Israeli-Palestinian human rights group and with new immigrants from Russia and Chechnya. I was about halfway through writing the book when I realized my stories all explored, in some way or another, the triangle between Cold War-era East European politics, Jewish American liberalism and the effect they had on contemporary Israel. But that was totally subconscious. And it was only once all the stories were finished that I discovered they weren’t linked by setting or character but by a question I hadn’t even realized I’d been asking myself: What are the complicated—and sometimes devastating—effects that one person’s quest to improve the world have on the people closest to them? In terms of writing advice, I heard Philip Roth speak once and he said something that really stuck with me: never let people read your early drafts unless you’re certain they’re on your side. 6. What are you most looking forward to about the One Story ball? Meeting the other writers being honored that night. And trying out some new dance moves. On June 6th, at our 4th Annual Literary Debutante Ball, One Story will be celebrating seven One Story authors who have published their debut books over the past year. As a lead up to the event, we have been introducing our Debs through a series of interviews about their debut book experiences. While the spotlight setting of Leigh Newman’s memoir Still Points North is the Alaskan countryside where she spent summers with her father, her story is one that anyone who’s navigated the choppy waters of adolescence will appreciate. Written with the clear eyes of an adult and the boundless elation of a child at heart, it’s a moving and vivid account of one woman fording the rivers of her own family history and living to tell the tale. I was on the Brooklyn Heights promenade. I had a 3 week old newborn in a sling and a 3 year old son in the stroller. Both were very mad that day and badly positioned in their little fabric child-prisons. And yet…I chose to pick up the phone. As they wailed and fussed and raged, my agent quickly and professionally mentioned that three editors wanted to talk to me. My face fell off. I was unemployed, under-financed and totally over-hormoned. I wanted to weep but I don’t do that in public. Instead I talked to my agent for 3 minutes, hung up, and kept marching down the tidy brick path home. There, in our living room, I did a dance with my impressionable young children that’s best left to the imagination. Think of a gnashing of teeth, only joyful and with the occasional botched cartwheel. We topped it all off with a truly astonishing amount of gummy worms. 2. This is a memoir, rather than fiction. How did you decide to write it and do you approach the two mediums differently? Failure can force your hand—right into a success or another star-spangled, soul-disfiguring failure. Because, of course, there’s momentum in failure, a rolling desperation that occurs in its wake—which either inspires you to do better or to just dive faster and more extravagantly towards to the bottom. Still Points North came directly out of that feeling. Prior to it, I had spent four years on writing a novel, and that novel was a bust. I couldn’t fix it and I was too afraid to start a new one and so I did the one option left, which is an option that most Alaskans are familiar with: do the thing you very much don’t want to do that might just save your life. In the wilderness culture that I grew up with, this is a literal sentiment: you have to dive into the cold fast-moving river and save the floating-away floatplane or lie there in a tent without moving until the bear attacks or wanders off. But here, it was metaphorical. I had to write a book I didn’t want to write or end the whole idea of writing. ….And so I wrote… all the while, screaming yuck. Who wants to talk about themselves? Not me. Not the people I grew up with. But as it turned out, I had a lot to say about king salmon and grizzlies and alders and homemade fish smokers and brave loving complicated families that fall apart. Because whether it’s a memoir or novel, there’s not really a difference in terms of how you tell the story. What you tell is different, because it’s life not fiction. But the way you tell it is the same. You show it, except when you have tell it. You get specific. You keep the good stuff and cut the rest. 3. The book spans a wide swath of time, from the summer after your parents’ divorce, when you’re eight, to when you’re grown up with children and a family of your own, with your relationship with your father acting as the through-line. What was it like to revisit these different periods of your life? Were some more fun or more painful than others? Well, the parts about our unpressurized single-prop plane getting up to 20,000 feet and almost falling out the sky or about our dinky raft getting swamped in a rapid-filled canyon (with us in it) or about the bear that paid me an early morning visit were fun to write. There is joy to all that always-almost-dying that you do in the wilderness—provided that you survive. Writing about my dad and I tromping around in hip boots and fishing was also fun. I miss that life. The parts about my family falling to pieces, however, my own marriage falling to pieces, my mother’s breakdown and her other assorted mental issues were not so fun. I don’t want to sound flip. But they were not fun at all. I write at dawn, before anybody gets up and those were some dark mornings. Probably what kept me going was a maniacal feeling I had that if you write a memoir, you have to go all the way, otherwise the risk of exposure isn’t worth it. And there was a wee bit of grace. The people I was writing about loved me, and I loved them. I was lucky in this, despite all the mess and upheaval. And as I wrote, I began to fall in love with them, to fall in love with all of my family in the deep and all consuming way we usually reserve for romance. 4. There are beautiful descriptions throughout of the Alaskan wilderness. You live in New York now, a very different sort of place. Did you do anything particular to get yourself into that setting while writing? Revisit old pictures or take trips back? I think I’m always in that setting, even when my body is somewhere else. So I didn’t look at anything except the slideshows in my mind. In fact, I was afraid of looking at anything—memoirs in general, or books of any kind about Alaska or websites about Alaska— because I suspected I would end up being so impressed with other people’s flora and fauna and nouns and adjectives and experiences, I would end up writing and thinking like them. 5. What was the revision process like for you? Do you have any advice for writers currently working on a book manuscript? I had a great editor. 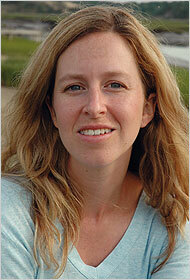 She is brilliant and her name is Jen Smith. She did what every writer wants: she edited. And her process was show up at lunch and sort of explain very casually over midtown sushi what was going right…and wrong. She could do this in about 3 sentences. That’s all she needed. First the beginning was working, but the rest not so much. Then the beginning and end were working, but the middle not so much. And then I began working on the middle….. seasons changed, saplings turned to trees, little baby ducks grew up into fat big ducks, icebergs melted. And still the middle was not working. In fact, it was horrible. So Jen and her assistant Hannah (also an awesome editor) suggested we cut it. Just pull it out. And so….we did, we pulled 120 pages out of the center of the book. What was left were two stories—the love letter to my dad and the love story of me and my husband—positioned side by side, which let the reader make the connection between the two, without the book having to explain things overly. I love that! It’s perfect, which I can say because I didn’t think it up and I can’t take any credit for it. So listen to your editor. One other rule: read her comments, wait 3 days, then respond. On day one, they seem like madness. On day three, genius. 6. What are you most looking forward to about the One Story Literary Deb Ball? The stairs. I find great comfort in NOT taking that elevator. One Story author Laura van den Berg (issue #102) will be appearing at NYC’s Cake Shop on Saturday, December 19th at 4pm, along with One Story staffer Elliott Holt and Brooke Shaffner, as part of the Enclave reading series. All the details and author bios can be found here. Laura’s collection of stories, What the World Will Look Like When All the Water Leaves Us, came out in the fall. The title story was a recent recipient of the Pushcart Prize. Be sure to pick up a copy here before heading to the reading. 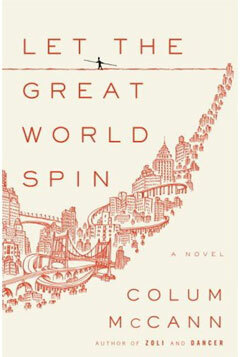 As announced last night at its annual gala in NYC, Colum McCann took home the 2009 National Book Award for fiction. His novel, Let the Great World Spin, was the favorite going in. The plot centers on a group of 1970’s New Yorkers and features a cameo appearance by Philippe Petit, famous for his daring tightrope walk between the Twin Towers. McCann was nominated alongside Jayne Anne Philips and Marcel Theroux as well as two short story collections: Bonnie Jo Campbell’s American Salvage and Daniyal Mueenuddin’s In Other Rooms, Other Wonders. For full coverage on the awards, including the winners for poetry, nonfiction, and young adult fiction, visit the NBA’s official website. Also announced at the Awards dinner was the reader-chosen “Best of the National Book Awards” which went to Flannery O’Connor’s career spanning The Complete Stories. Congratulations to all the winners and nominees! Those looking for a unique, one-of-a-kind gift for bookworms might want to stop by the Grub Street website and check out the author postcards up for auction. Grub Street mailed 29 authors a blank postcard and allowed them free creative reign for their designs. Several One Story authors were among the participants. Along with the enchanting image above, designed by Lauren Groff (issue #112), check out the entries by Steve Almond (issue #31), Ron Carlson (issue #99/100), and Daniel Wallace (issue #49), as well as such other literary luminaries as Amy Hempel, Lorrie Moore, Elizabeth Strout, and James Franco, who signed a highly-publicized book deal earlier this year. Once you’ve made your choice, you can place your bid and cross your fingers. Winners will be announced at the annual A Taste of Grub party on November 6th. All proceeds go to supporting Grub Street’s wonderful writing programs. One Story on the Go! Look closely, readers. In case any more proof was needed of One Story’s endless portable possibilities, that’s a copy of issue #124, Frost Mountain Picnic Massacre, attached to the handlebar of that bike. This photo was snapped in the subways of NYC and sent to us by subscriber Cynthia Ball. We’d love to know if you’ve spotted One Story in any surprising places. Please share links, photos, or stories in our comments section below! For readers interested in both instant gratification and bite-size stories, One Story author Andrew Foster Altschul (issue #62, “The Rules”) has the perfect deal for you. He is the editor of and one of the authors taking part in Fivers: Flash Fiction for the Phone, along with Joshua Furst, Kaui Hart Hemmings, Anna North, and Lemony Snicket. Fivers is a new experiment in publishing, delivering a mini-anthology of five flash fiction pieces directly to all compatible mobile phone devices. If you would like to download the stories, visit the iTunes store or click here for more information. And if you like what you read, be sure to leave a nice comment either on our blog or the iTunes review page! Lydia Peelle named one of the 5 under 35! Congratulations are in order for One Story author Lydia Peelle (issue #87, “Reasons for and Advantages of Breathing”), who has been selected as one of the Top 5 Authors Under 35 this year. Lydia was chosen by 2008 National Book Award fiction nominee Salvatore Scibona and was named alongside fellow short-story writer Karen Russell, and the novelists Ceridwen Dovey, C.E. Morgan, and Josh Weil. The honor is given out by the National Book Foundation and recognizes emerging talent in the fiction world. Its yearly celebration, to be held in Brooklyn on November 16th, kicks off National Book Awards week, which culminates in the announcement of the 2009 winners. More information on Lydia and the other honorees can be found here. And if you haven’t yet, be sure to pick up Lydia’s book, which the NYTimes says has “a wildness under the surface … that calls to mind masters of the unsettling short story like Mary Gaitskill, or even Alice Munro.” Get it here or at your favorite local book store. James Hannaham Reading in Brooklyn! For those in the Brooklyn area this Thursday, October 1st, James Hannaham, author of One Story issue #121, will be reading as part of the Brooklyn Reading Works series. The night’s theme is “Young, Gifted and Black (Men)” and will feature James, along with Cliff Thompson and Victor LaValle. It’s being held at the Old Stone House in the Park Slope neighborhood at 8pm. You can find more info on the event and RSVP here. 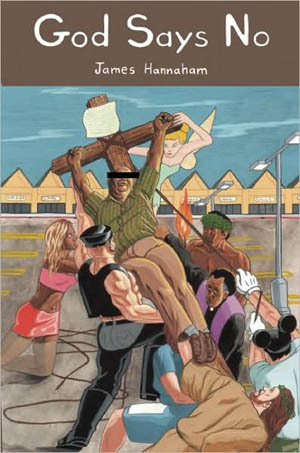 To find out more about James’s new book, God Says No, click here for his interview with Bookslut. Jennifer Egan has called it “Topical and ambitious, disturbing and hilarious, God Says No is everything a person could ask of a first novel — and twice that much.” You can buy it here or at your favorite local book store, and be sure to have James sign it at the reading!